It’s not often that I get a cookbook that knocks my socks off. Don’t get me wrong, I adore cookbooks of all kinds and thoroughly enjoy reading them along with food websites, magazines and pretty much all food related literature. I read quite a bit regarding this topic. Perhaps too much and it’s been a while since something has left me thinking “damn, why didn’t I think of this?” And Miss Christina Tosi, by god, you’ve done it. The book of which I speak? 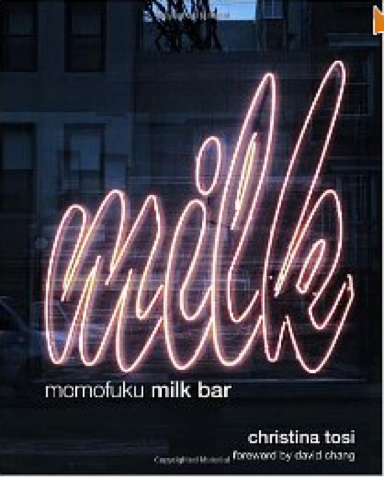 Momofuko Milk Bar. It’s an unusual one, technique heavy and full of truly unique concoctions. Cereal Milk Ice Cream? But of course! That’s the whole reason for eating a bowl of cereal, after all. Apple Pie Cake? Oh my. Compost Cookies? Genius. Page after page of original thoughts, entertaining header notes and creative versions of old favorites. It’s often said there are no new ideas, just variations on existing ones. After going through this book, I’m not so sure. Everything here is somewhat familiar yet different. There are things in here that I’ve never even considered. A tip of the hat to you, Ms. Tosi. Dammit. I actually pre-ordered this book on Amazon months before release, which is something I’d never done before. I read the article in the LA Times about Crack Pie a while back and made it over the summer. It was something else – achingly sweet, utterly delicious and completely addictive as the name suggests. A little involved (you have to make a cookie first to make the crust) but worth it. I was curious to see what else she had up her sleeve. While flipping through, I came across an interesting recipe – Corn Cookies. Sounded intriguing. It was cold outside and I could almost taste the crunchy sweet corn flavor transporting me right back to a summer outing at a pal’s cabin. My interest was piqued. Coincidentally, I was in the market for a unique cookie. A rather fancy holiday cookie exchange was on my horizon, one that has historically caused a little anxiety. A cookie exchange was nothing new, I’d been attending them since my childhood except those were held at Maricopa Lanes with my Mom’s bowling league. This was something entirely different. This one is held in a gorgeous Lake Shore Drive home, overlooking a stormy Lake Michigan. After a nice lunch, coffee from a silver samovar and lots of pink bubbly, attendees are given large, beautiful boxes and instructed to circle the antique dining table taking 2 from each of the 30-plus offerings. I should also mention that half the crowd is pastry chefs and culinary professionals. It’s great fun and the hostess is wonderful but you have to show well at this thing, if you know what I mean. No chocolate chip cookies or things made with cornflakes unless you are intentionally trying to be ironic (in which case a touch of gold leaf will help convey that.) Finding the right cookie is rather important, to me at least. I always try to come up with a delicious and unique cookie, something that will look good on the over laden table. So I decided to make this Corn Cookie, much smaller than indicated and sandwiched with a Salt & Pepper Buttercream. Sweet corn, butter, salt, pepper … the perfect combination. Stand out they did amongst the gingerbread, molasses, shortbread and macarons. Light yellow rounds with a white, speckled filling perched prettily on a frosted glass plate. Went over like gangbusters. Whew. I have to say, these are delicious. Unusually delicious in a buttery, esscence of corn kind of way. Chef Tosi uses the cookie for all sorts of other things too – for the cookie crumbs in a pie crust and as the bread in a ham & cheese sandwich. Sounds crazy doesn’t it? I imagine it would taste like a crispy griddle cake. When you think of it like that, putting ham and cheese between it make perfect sense. I’d eat it. The secret of these cookies lies in freeze-dried corn. I knew The Spice House had it as I’ve been know to eat quite a bit of the samples by the register from time to time, but I was surprised to find it in my regular grocery store under the “Just Tomatoes” label. I used about half of the 4-ounce bag and ground the kernels fine in my spice grinder. I found the corn flour easily too at the same store – Bob’s Red Mill comes through again. There are some particular techniques to pay close attention too – first off, cream the bejesus out of the mixture. This is important otherwise you’ll have heavy cookies. Secondly, chill the batter so it holds it’s shape – I chilled the dough, rolled 1” balls and then froze them. 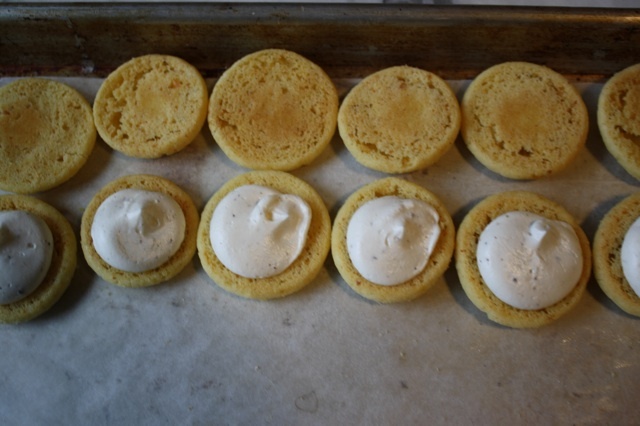 Finally, be sure to slightly under-bake the cookie – they will continue to cook after after coming out of the oven. Remove when they feel quite soft but the top has crusted over and they’re ever so lightly browned on the edges. The cookie will collapse a little as they cool, which is exactly right. STRESS BAING THERAPY FACTOR: BUTTER ME UP. This is a good one when you need to impress. 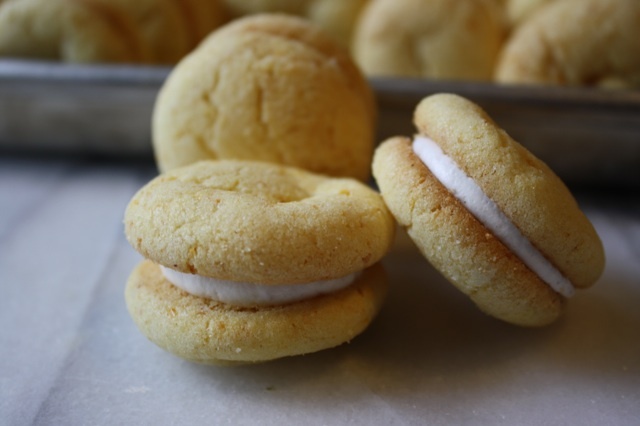 It looks rather unassuming, just a little yellow cookie with some white stuff in between but the flavor will surprise. It’s salty sweet, has a mysterious little kick to it and the smallest hint of sweet corn flavor. People love them but might not place the flavor right away, it’s so unexpected. When you’re tired of chocolate chip, brownies and snickerdoodles make these. People won’t know what hit them. 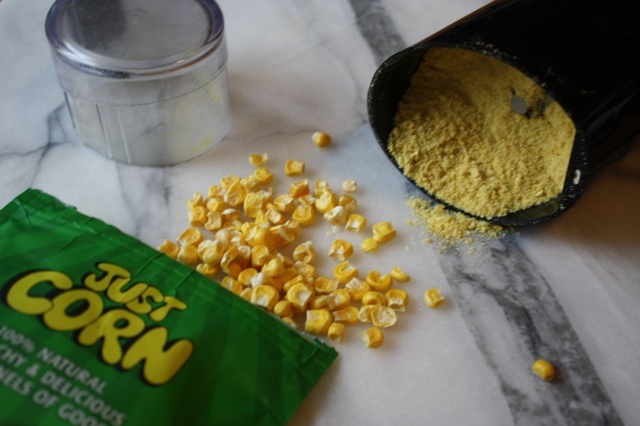 Process freeze dried corn in a spice or coffee grinder to a fine powder. You can find this at The Spice House or better grocery stores (look for the “Just Tomatoes” brand.) Bob’s Red Mill makes an easy to find corn flour or check out Hispanic grocery stores. for the cookie dough: In the bowl of a mixer fitted with the paddle attachment, cream the butter and sugar on medium-high until light and fluffy, about 2-3 minutes. With the mixer on low, add the egg and beat until blended. Increase the speed to medium-high and beat for 8 minutes until very pale in color and nearly doubled in volume. Reduce the speed to low and add the flour, corn powder, corn flour, baking powder, baking soda and salt. Chill the dough, in the bowl is fine, for about 1 hour to make it easier to roll. Scoop 1 Tablespoon portions of cookie dough and roll between your hand to form balls. Place on a parchment lined sheet pan, touching gently is fine, and freeze until solid, at least 2 hours. Transfer to a Ziploc bag for longer storage if you don’t plan on baking within the next day or so. Bake, rotating the pans halfway through for 10-12 minutes total until cookies are soft but lightly crusted on top and very lightly brown on the edges but still bright yellow in the center. Cool completely on the sheetpan before transferring to an airtight container and store for up to 5 days or in the freezer up to 1 month. 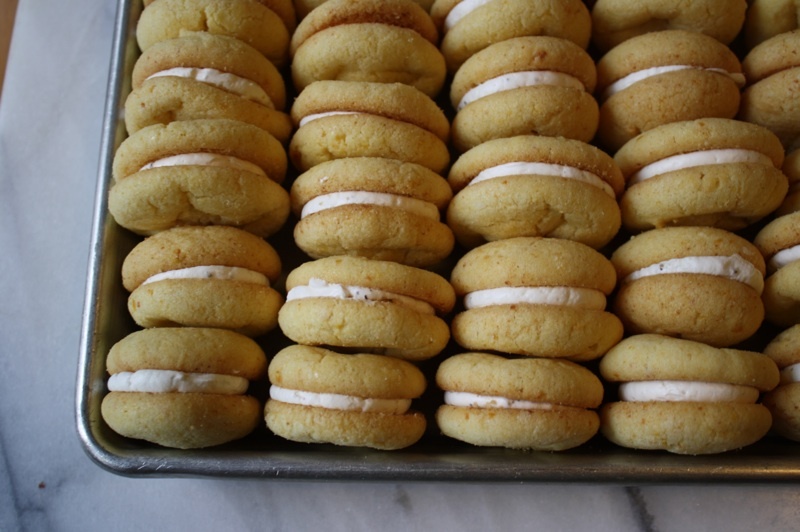 to fill: match up cookies in same size pairs and pipe salt & pepper buttercream on the bottom of one cookie. Top with another same size cookie and gently sandwich together. This Swiss Buttercream is pretty easy to put together and very delicious. Make sure the butter is cool; soft but cool. The recipe will make more than you need If you prefer, add the salt and pepper to about 2/3 of the mixture and reserve the plain buttercream for another use. It will freeze for up to 3 months; rewhip before using. In a heatproof bowl, whisk together the egg whites, sugar and salt. Place over a pan of simmering water and whisk until sugar is completely dissolved. To test, rub the mixture between your fingers; if it’s gritty the sugar isn’t fully dissolved. Transfer the mixture to an electric mixer and beat with the whisk attachment on high until completely cool – about 5 minutes. This is important – if the mixture is still warm, it will melt the butter. Add the butter, a 1” piece at a time, beating on medium speed until smooth. Scrape the bowl occasionally. Add the vanilla, black pepper to taste and additional salt if needed. 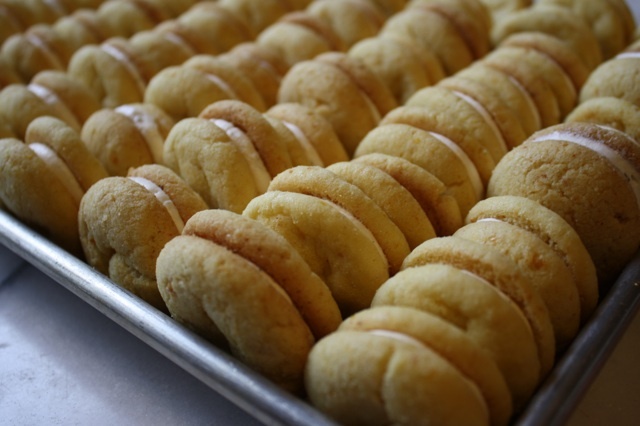 Transfer to a piping bag and fill the cookies as directed above. I’m making these right now all because of your post! Cannot wait to taste them!